Holiday Inn Express London Stansted Airport - (5 min from the airport) Shuttle bus operates every 30 minutes from 4:00AM to 12:45AM (£3.00 per person, 17 and under free). which, parts due to pricing, parts due to my brand loyalty, is my favorite right now. When arriving to the hotel from central London, is there any public transport stop that is still regularly being served late at night (past dinner time, but say before midnight), from which it is possible to walk to the hotel without walking on the street, risking to be run over, excluding the London Stansted train stop that I am already aware of? 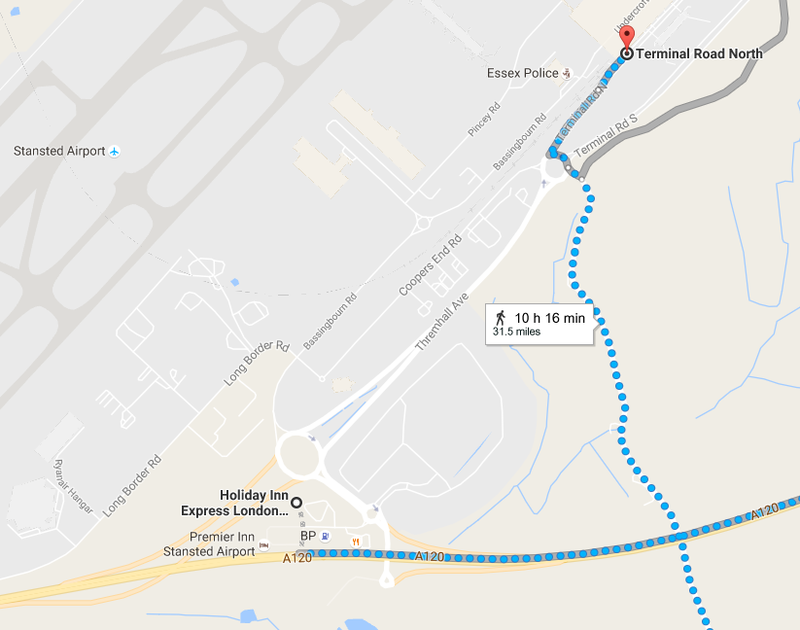 Is it possible to walk from said London Stansted train stop (the one in the airport) to the hotel (and back) without having to walk the curb of the road? Google maps shows it as being no more than a mile which would be fine with me if it is not raining, but I would prefer to not risk being run over and it will be dark when I have to do the journey. I did ask Google for directions and it returned me an absurd 35 mile hike, lasting a mere 10 hours along some highway. I also checked street view and was not able to find any pedestrian walkways. Would a cab from the airport be willing to take me to the hotel in case? I am doubting because the distance is very short and the driver might prefer giving me someone else a ride to the center. Money-wise it seems to be roughly equal, for two persons the shuttle is £6 and Google tells me a taxi for such a short distance should cost £9 roughly, and I might prefer not to wait 25mins for the shuttle bus. There appears to be an entrance to the airport carpark off the same roundabout that provides access to the Holiday Inn. Based off this streetview view it appears to be the "mid-stay" and "free set down" car park. There is a bus with "7" written on it entering at that time. You'd still have to walk some distance through the car park, and then along the verge/road across the dual carriageway and roundabout, but it avoids the longer walk down Thremhall Avenue. Transfer time: 4 - 5 minutes by shuttle bus. Free shuttle buses operate every 10 minutes. Buses operate 7 days a week, 24 hours a day. It's not clear from the website where you catch the car park bus from at the terminal end however. Yes, I believe it is possible. Google maps seems to have got confused as to where the hotel is, and about access on the large East West road. By dropping the destination pin correctly, your ten hour walk can be reduced to 8 minutes, like this or to 25 minutes like this (from the station). Note I haven't actually done the walk concerned. The easiest hotel to reach by foot from Stansted is the Radison Blu Hotel Stansted Airport, which is around 3 minutes walk away and involves crossing no major roads. Note the Holiday Inn Express per this page has a shuttle bus too. It doesn't say whether it's 24 hour, but they often cover all times passengers want to travel; you could ring the hotel to check. I have walked from Stansted Airport to "Premier Inn Stansted Airport" several times. Which is very close to "Holiday Inn Express Stansted Airport"
But have in mind that I only travel very light. I am a backpacker that hate to waste good money on services not needed. You can walk from the terminal in around 15-20 mins however there are no safe walkways you will be walking on verges next to main roads and for safety reasons is not recommended. The shuttle bus leaves from bay 21 at the airport bus terminal every half an hour on the quarter too and quarter past the hour with the last bus leaving at 00:45. Alternatively a taxi is around £8.50 meaning that if there is 3 or 4 of you it would be cheaper to take that option. Not the answer you're looking for? Browse other questions tagged airport-transfer london hotels walking stn or ask your own question.